Carry the benefits of aromatherapy around your wrist with this essential oil diffuser bracelet. Hippocrates once said, "the key to good health rests on having a daily aromatic bath and scented massage." You might not be Hippocrates, and you might not have time for a massage every day, but you can get a daily dose of aromatherapy with this colorful essential oil diffuser bracelet. 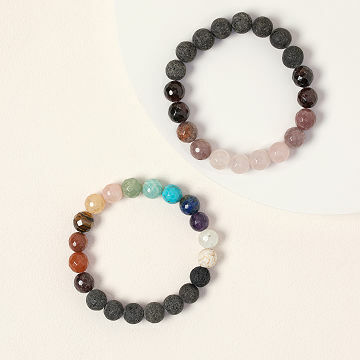 Its gorgeous design includes bright, elegant beads and lava stones that emit small bursts of calming scents. Just add a drop of your favorite essential oil to the porous lava rocks to keep peace and serenity close by all day long. Designed by Jennifer Bravo-Grulkey and made in New York. Lavender (Relax): An all-time classic floral, woody scent to soothe, calm, and balance. Blue Gum Eucalyptus (Invigorate): A strong earthy, mint fragrance with a kiss of honey to refresh and invigorate. Sweet Orange (Enliven): A light, sweet fragrance with soft citrus notes—like when you peel an orange—to invigorate the senses. Bracelet sold separately from essential oils. Simply add 1-2 drops of your favorite essential oil directly on any of the four lava stones and enjoy. Reapply oils as needed. This arrived promptly and is a beautiful as pictured! I'm very pleased with my purchase. This is a gift for my best friend. She is an amazing woman and that is why I always try to find her some almost as amazing as her. She loves essential oils and the color teal so this will; be perfect, i hope. Bought this for my daughter who has constant anxiety. She already has a diffuser in her room, but now she can take her calming oils with her! Love this bracelet, it's beautiful and I think my sister will love it!! Only thing I need to say other than it's lovely is that when adding oils maybe just a drop or two total, on each if the 4 beads it can be strong. Put it on something so you don't accidentally get it on you and ekt it sit for a little bit to prevent any risk of irritating your skin. But the scent stays for a long time. Wife lives it. We are happy with the product...would but again and recommend it to others. product is awesome if you love essential oil smells throughout your day.